am curled up on the recliner in my family's living room with a beautiful view of our hilly yard and our neighbor's field.. A mug of amaretto coffee is steaming next to me, and the busy sounds of my homeschooling siblings are wafting up the stairs in a comfortable chatter. Right now I am on spring break, and for the first time since last summer, I have a few days with no plans whatsoever. There will be lots of reading, board games, hiking, visiting friends, and the bare minimum of homework and Shoppe work. My major leaves no time for downtime. In the design program, we are in the classroom for six hours a week per three-credit-hour class. Inevitably, the entire class time is spent on critiques or rambling lectures, so after eight or so hours of classes I have to spend all night doing the actual work. Tack on the occasional necessary night class, the extra requirements for gen-eds and honors, having a social life, networking stuff, and, of course, running my Shoppe-- boredom is a luxury that I'm soaking in right now. And so, I'd like to share some of the work I made in freshman and sophomore year! I've already blogged about Drawing I, Drawing II, 2D Design, Color Theory, a project for Typography, and about a third of the good pieces for Photography. (It's hilarious to go back and look at these old posts; not only have my skillsets grown since them, but my opinions and perspective on school have changed). The commissions that make me the happiest are the crazy, intricate ones that I weave every ounce of magic into that I can. 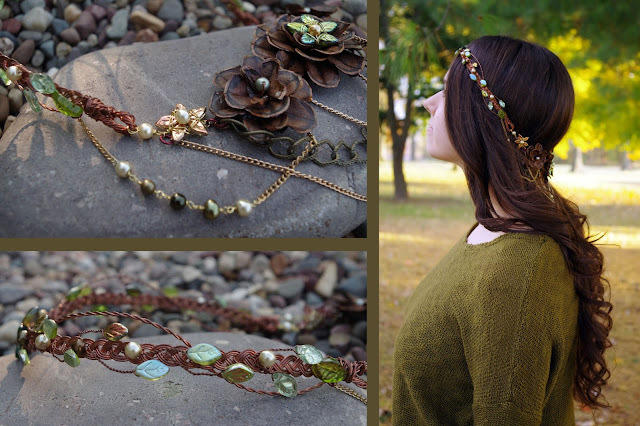 The Entwife headpieces (this is the fourth version) are among my favorites: they are crafted from pinecones, Czech glass, copper oxidized to several rich shades, creamy pearls, and weeping-willow chains. I was thrilled to have a chance to take such beautiful photographs before shipping this piece out! Four friends joined me in a local park and we pranced around the autumn leaves right before sunset. 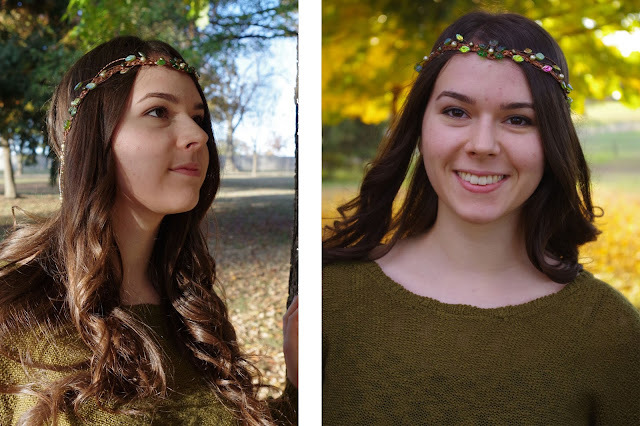 The original Entwife circlet was designed for a friend's Lord of the Rings costume just as I was beginning to sell jewelry. 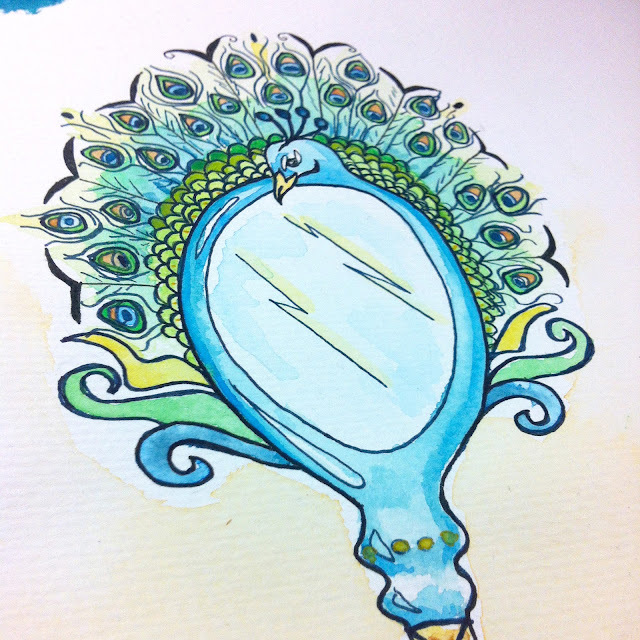 Since then, I've made some other variations; see those pictures here, here, and here. This latest version featured extra wirewrapping and more beads than ever before. I also used six, yes, six, shades of green leaves. 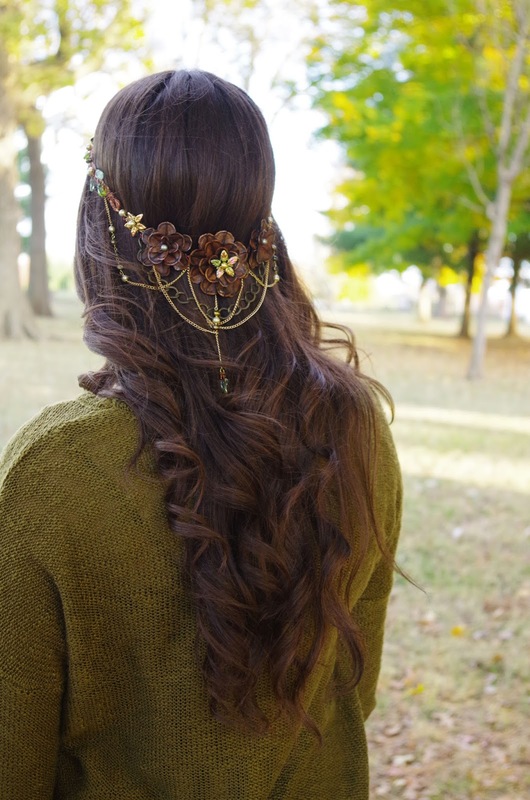 I believe it is being worn for a wedding this month! The details show up better here; thank you to C. for being another model! You can see how much different head sizes affect the way that the headpiece fits. I will be sharing additional pictures from our photoshoot soon!